When a person thinks of plants, it is likely that a flower comes to mind. Flowering plants, also known as angiosperms, comprise about 80% of all plant life on earth. Angiosperms have been successful in the plant kingdom in large part due to their ability to quickly adapt to environmental pressures and further their niches by pollination. Figure 7.18: The graphic above shows the general structure of a flower, along with the typical parts of a flower. Flower petals are typically intended to attract attention from pollinators. Petals are often scented, colorful, and contain nectar. The petals are usually located above the sepals of the flower. The sepals are leaf-like structures at the base of the flower and protect the flower bud in the early stages of development. Bracts are specialized leaves that are also often employed to attract the attention of pollinators. Bracts differ from the plant’s regular leaves in that they are often smaller, can be more brightly colored, and are located in proximity to the flower. 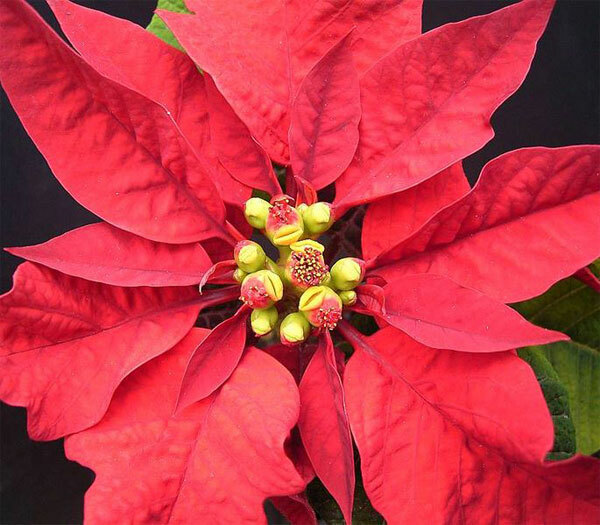 Figure 7.19: An excellent example of bracts is found on the poinsettia plant. The bright red leaves are bracts surrounding the inner yellow flowers of the poinsettia. In this example, the bracts are approximately the same size as the plant’s regular leaves. The female part of the plant is called the pistil (or carpel) and consists of the stigma, style and ovary. The stigma is the sticky top section of the carpal that attracts pollen grains. The style is the stalk that connects the stigma to the ovary. Once a pollen grain attaches to the stigma, a pollen tube will grow between the stigma and the ovary, providing a pathway for pollen to reach the ovary. Click here for more detail about pollen tube growth and to view a video of pollen tube formation from Physorg.com. The male part of the plant is called the stamen and consists of the anther and filament. Pollen grains are made in the stamen. The anther is the specific section of the stamen that bears the pollen grains, while the filament is simply the support stalk for the anther. Click here for an interactive flower parts puzzle from the University of the Western Cape; click through to view each flower part and read a complete description of each part and its function.